Decydując się na współpracę z MITKO możesz być spokojny o to, że Twoi klienci dostaną najwyższej jakości towar na czas. Gwarantujemy ekspresowe terminy realizacji zamówionych produktów. Służymy pomocą na etapie projektowania oraz wysyłki towaru. Oprócz tego otrzymasz od nas narzędzia wspomagające sprzedaż i promocję. W skład każdego pakietu współpracy wchodzi zestaw odpowiednich narzędzi wspomagających sprzedaż i promocję. Oznacza to, że w ramach współpracy pomożemy Ci znaleźć klientów. Wszystko czym musisz się zająć, to dystrybucja zakupionych u nas produktów. In 2014, we established cooperation with one of the most dynamically developing distributors - SO Communication Company headquartered in northwestern France. The owner of the company was looking for a reliable event product supplier that could excel in its high quality of commonly available Chinese tent poles and event accessories offered by the competition. Its main objective was to offer products that are not available on the French market. From the first contact, the arrangements and the signing of the so-called Powered by contract until the first sale took only a few weeks. During this time, together with our partner, we were able to set all conditions of cooperation and all conditions of sale of MITKO equipment in France. As early as 2014, not more than a few months after the MITKO devices were included in the offer, MITKOs products turned out to be leading products of its kind in the product portfolio of SO Communication. The first year of cooperation has proved that MITKO tents have been well received in the demanding French market. Together we have completed several major contracts for the French household sector, the media and the automotive industry. We participated together in the prestigious advertising trade fair Heavent in Paris, which brought new contracts and development opportunities to our distributor. The period 2015-2017 was one of the dynamic developments of SO Communication. 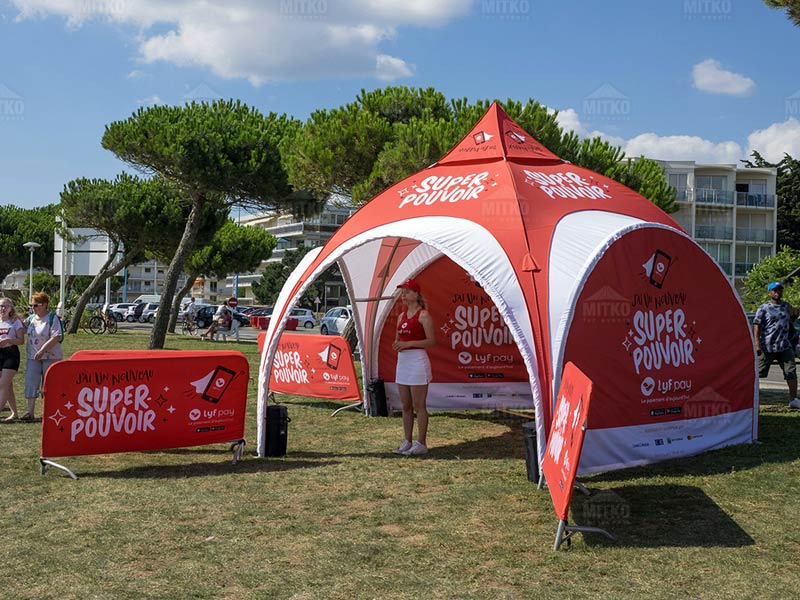 Thanks to increasing sales, the company has expanded its workforce and put it even faster on the expansion of the French market for tents and advertising accessories. There are also plans to build a showroom and expand the offer to rent tents to reach new customers. In 2018, MITKO decided to focus on strengthening cooperation with their distributors. We have refined and updated the terms of cooperation. We changed the labeling strategy of products that allowed the distributors to display logos in the target markets. This aroused tremendous enthusiasm from SO Communication. New terms of cooperation also allowed the official display of corporate contact information on the MITKOs international website - www.mitkoforevents.com. This year, SO Communication plans to open the office and warehouse in a new location in Brittany - the region in which it currently operates. For logistics services, hiring two new employees is planned. We are convinced that through cooperation with MITKO our partner can carry out the planned structural change and further expansion calmly and effectively.